Easter coloured wet-on-wet technique egg cookies. Cupcakes, cakes, candles, hearts, and a name plaque. Creepers and Skeletons with airbrushed block pattern. Lightning McQueen faces, lightning bolts, tire tracks, and #5. Purple, pink, and green owl cookies. Teapot cookies in pink, purple, and white with stripes and polka dots. Blue thank you note cookies with flower accent. Footballs and BC Lions' helmets. Frosting / sugar sheet clown mask cookies. "Henna Art" cookies. 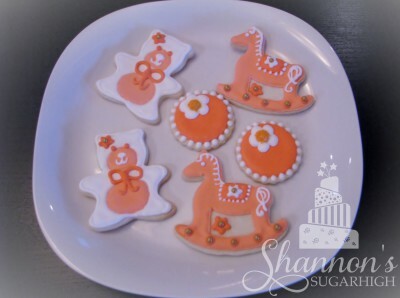 Design credit: Sugar Bea's Custom Cookies. Unicorn head with rainbow mane and shimmer airbrushing. Freestyle hair silhouettes, blow dryers, and hair scissors. Blue and white cookies for a little boy turning 2. Various Lego man faces and Lego bricks. Firetrucks, fire hydrants, fireman hats, and Dalmatians. White, pink, and gold birthday cakes, cupcakes, and ovals. "Kooky Cookie" and "D'lish Donut" characters. Thomas cookies for a child's 2nd birthday. 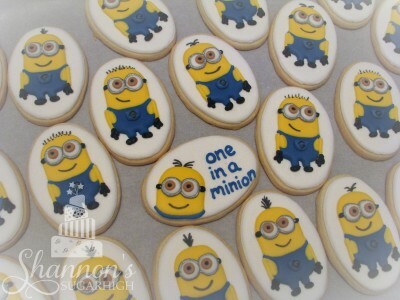 Cookies with edible images. Graphics by Mygraphico. Variety of Shopkins characters printed on edible sugar sheets. Flowers, butterflies, and dragonflies made to accompany a "Fairy Garden" cake. Wedding dresses and wedding cakes in white and light pinks. Rustic set including wood plank effect in browns and pinks. Rosettes in spring colours with airbrushed centres. 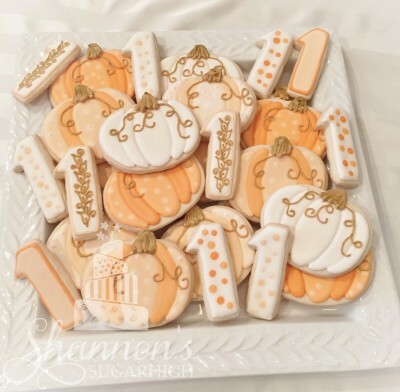 Take home cookies with printed edible ink sugar sheet design. Monster trucks, circles and number 4's with airbrushed patterns. Heart shaped cookie for teacher with brush embroidery technique. Bones, paws, dog houses, and dog face with bowtie and top hat. Paw Patrol theme dog bones and paws. Footballs and Seattle Seahawks helmets. Simply decorated traditional gingerbread men for Christmas. Trees, candle, holly, wreath, candy cane, stockings, & snowman. 3-D gingerbread cookie Christmas tree with royal icing decorations. Santa, fawn, snowman, snowflakes, Star of David, & dreidels. Pumpkins & number 1's in orange ombre, white, & gold. Skeletons, cats, pumpkins, moons/bats, & spider webs. Spider web with harry orange spider. T-Rex, Stegosaurus, dino egg, number 3, and "Roar". 2" & 3" flowers in shades of pink for little girl's tea party. Elmo faces painted with glaze. Heads; smile, laugh, wink, surprise, & with sunglasses. Wine bottles with edible frosting sheet labels. Brush embroidery hearts, wine bottle, & wine glasses. Fire trucks, fire hydrants, and fire hats. Fire trucks, fire hydrants, and Dalmatians. Teddy bears, rocking horses, and flowers. Wedding colours of lavender and moss green, with burgundy and white accents. Includes wood effect cookies, flowers, wedding cakes, mason jars. Sword cookies on gingerbread with silver and gold shimmer airbrushing. Hearts in pastel colours of ivory, blush, and turquoise with a rose accent. Variety of Minion characters on a white, oval background. Join our community for updates & special offers! Follow me for cake decorting inspiration and ideas!